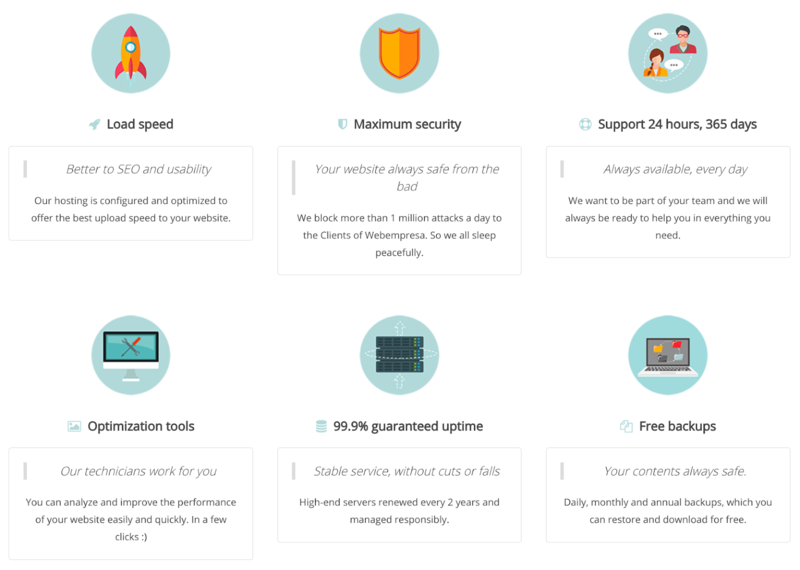 Webempresa Review 2019: Is Webempresa a Good Hosting? Established in 1997, Webempresa is website hosting provider based in Spain. The company specializes in the provision of hosting solutions for WordPress, Joomla, and WooCommerce websites. Webempresa is a web hosting vendor that was established in 1997. Its servers are located in France and Spain, and it maintains a team of at least 50 staff who support more than 40,000 customers in Spain, Peru, Argentina, Colombia, Costa Rica, Chile, Dominican Republic, Ecuador, Mexico, Panama, Uruguay, and the United States. Webempresa offers an array of hosting solutions that include WordPress, WooCommerce, Joomla, and shared web hosting. The Webempresa website is available only in Spanish. Webempresa uses SSD servers and Magic Cache (an exclusive cache system) to ensure that their hosted websites load fast. The vendor’s hosting solutions include anti-hacking protocols that block unauthorized access to their customers’ accounts and websites. One feature I was particularly impressed by is their image optimization feature that optimizes your images to improve web page loading speeds. Over 8,000 Webempresa customers already use this feature. I also loved the vendor’s automatic backup feature that backs up their clients’ websites every four hours. Webempresa’s website is well-organized and easy to navigate, even for new users, and their hosting solutions use the equally user-friendly cPanel control panel (with tutorials to help you make the most of it). The control panel is complemented by the Softaculous one-click installer. Webempresa’s hosting solutions are reasonably priced. The vendor only has an annual billing cycle, but they do have a “no questions asked” 30-day money-back guarantee that might make you feel better about making the commitment. They have simplified the process of upgrading and downgrading hosting plans so you can move from the basic starter plan all the way to their premium plans with ease. All of this vendor’s hosting plans include a free Let’s Encrypt SSL certificate, but users who want more advanced security can purchase the Comodo SSL certificate. Webempresa offers a 99.9% uptime guarantee which means that their downtime during a whole year is only 36 hours. Their compensation plan gives users a full month of free hosting whenever uptime availability falls by 1%. The three ways to get in touch with Webempresa are live chat, a prioritized ticketing system, and email. They have no telephone support, and users cannot contact the technical team without first having submitted a ticket and waiting for them to respond. While the technical team works 24/7/365 and has an average response time of 30 minutes, I have to say that their technical know-how leaves a lot to be desired. The knowledge base section of their website is no better (it’s empty), but they do host an active forum where users and Webempresa employees can converse about the challenges that users are facing. Webempresa has invested quite heavily in its hosting infrastructure and expertise to deliver reliable, time-tested hosting solutions for businesses in Spanish-speaking countries. Unfortunately, potential customers who don’t speak Spanish might be put off. Wondering how Webempresa stacks up against other Web Hosting companies? Enter any other Web Hosting company and we will give you a side-by-side comparison.